We do not get too many opportunities to get to English speaking retreats here in Switzerland, so it is nice when one comes around. 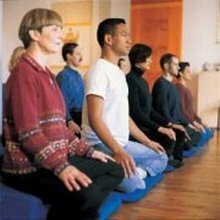 From Thursday evening March 3rd to Sunday March 6th, Christina Feldman will lead a silent retreat at the Meditation Centre in Beatenburg, near Interlaken. Christina is an excellent teacher and author who has been leading insight meditation retreats internationally since 1975. She has trained extensively in the major Buddhist traditions. She is a guiding teacher of Insight Meditation Society in Barre, Mass., U.S.A and is co-founder of Gaia House in Devon, England. Her books include Compassion, Silence and The Buddhist Path to Simplicity.